It’s important to have your washing machine working correctly, that’s why when your Siemens washer is out of service, you need a quick fix. Warranty service can be provided for free, but the guarantee period lasts about 12 months. Third-party service centers are expensive, and repair takes some time. Why not fix everything on your own? 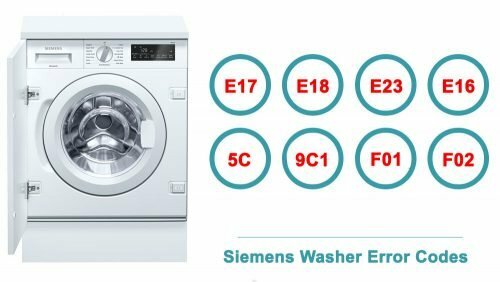 Using the manuals below, you can repair and maintain your Siemens washer without help. They cover different models and series of Siemens washers and provide step-by-step instructions. You can find the most common technical problems, possible causes, and the ways to solve the issues. Instructions were provided by the official manufacturer, they are comprehensible for an average user and can be followed even if you don’t have technical knowledge. Besides, the tables include error codes for different models and series of washers. 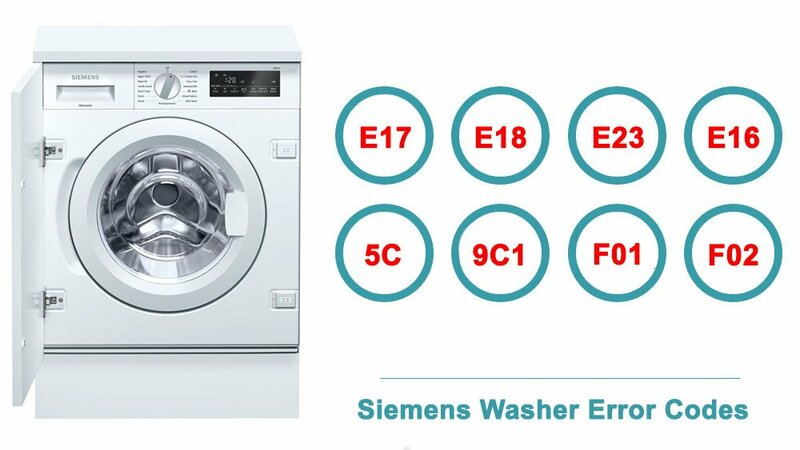 If your Siemens washer displays an error, you don’t have to search for the official printed manual to figure out what exactly is wrong. The tables will supply you with all the essential information concerning the errors and ways to fix them. Even if your model isn’t mentioned here, the instructions for other models from the same series can apply. Despite the fact that these step-by-step guides are written for a regular user, some repair measures should be taken by professionals only. If you find it hard to deal with some certain failures, don’t hesitate to call a service center. NO ■ The temperature is too high. Wait until the temperature falls. O flashes ■ Laundry may be caught. Please open and close the washing machine door again and press Start/Reload . ■ If necessary, push the washing machine door closed or remove the laundry and push it closed again. ■ If necessary, switch the appliance off and on again; set the programme and make your individual settings; start the programme. ■ The water pressure is too low. - Clean the filter in the water supply. E:18 The detergent solution pump is blocked. Clean the detergent solution pump. E:23 Water in the base tub, appliance leaking. Turn off the water tap. Call the after-sales service. Foam flashes Too much foam detected, a rinse cycle has been switched on. “:” The mains voltage is too low. “.” Undervoltage in the wash programme. The programme is extended. Other displays Switch off the appliance, wait for 5 seconds and switch it back on again. If the dis- play appears again, call the after-sales service. Appliance does not start, no indicator lamps are on • Plug is not properly inserted in socket. • Socket or fuse does not function correctly (use a table lamp or similar appliance to test it). • the “On/Off” button has not been pressed (if available on your model). Appliance does not start although “Start/Pause” has been pressed • Door is not properly closed . (if available on your model). To unlock the buttons, push the two buttons marked with the key symbol simultaneously and hold them at least for 3 seconds. The key symbol on the display disappears and the programme can be started. lights up in the programme sequence indicator. Press the “Start/Pause” button to start the drain programme. • Programme has been changed - reselect desired programme and press “Start/Pause”. • Programme has been interrupted and eventually door has been opened - close door and restart programme by pressing “Start/Pause”. • The appliance’s safety system has been activated. • Water tap is not opened or water inlet hose is kinked or blocked (“Water tap closed” indication lights up). Detergent dispenser contains residues from detergent and/or additives • Separator in main wash chamber is not correctly installed or not adapted to use of powder and liquid detergent. • Water entering is not enough; the mesh filters of the water supply could be blocked. Appliance vibrates during spin cycle • Transport bolts have not been removed; before using the washing machine, it is imperative that the transport bolts are removed. • Appliance is not level / not standing firmly on all four feet. Final spin results are poor The appliance has an imbalance detection and correction system. If individual heavy items are loaded (e.g. bathrobes), this system may reduce the spin speed automatically or even interrupt the spin completely in order to protect the washing machine. • Heavy item(s) prevented spinning; add smaller articles of laundry and repeat spin cycle. • Excessive foam formation prevented spinning; select and start “Rinse & Spin” programme. Avoid excessive detergent dosing. • “Variable spin” button has been set to a low spin speed. Detergent residues on laundry after wash Whitish residues on dark fabrics are caused by insoluble compounds used in phosphate-free powder detergents. Programme time initially displayed is lengthened / shortened by a period of time (only for appliances having a display which indicates the remaining programme time) Normal capacity of the appliance to adapt to factors that can have an effect on the wash programme time, e.g. : Excess of foam formation, load imbalance due to heavy items of laundry, prolonged heating time resulting from reduced inlet water temperature. Due to such influences, the programme time is recalculated and updated if necessary. On the display, an animation appears during such update periods. The washing machine is at a standstill for several minutes in the middle of a running programme; the wash programme seems not to proceed Normal function of the washing machine used for optimizing the rinse phase. One reason for such a pause can be that you might have used too much detergent; the washing machine automatically interrupts the programme to have the foam reduced. This standstill may be repeated several times until the foam reduction is sufficient to continue the wash cycle. Programme duration is considerably longer or shorter as indicated in the “programme chart” or on the display (if available) Normal function of the washing machine to adapt to factors that can have an effect on the programme duration, like excessive foam formation, load unbalance due to heavy laundry items, prolonged heating time resulting from low inlet water temperature etc.. Moreover, the sensing system of the washing machine adapts the programme duration to the size of the wash load. Depending on these factors, the duration is recalculated during the programme and updated if necessary; during such periods, an animation appears on the display (if available). For small loads, the programme time indicated in the “programme chart” may be reduced by up to 50%. Close the washing machine door. E:17 Tap not turned on. Turn the tap on. Drainage pipe blocked. Clean the drainage pipe. There is too much residual water in the drum when drying Stop the drying process, select the “ Single Spin” before drying . The “Ready/Wash” and “Start/Pause”indicator light flash. Loading door not closed Check whether laundry is trapped in door. Close the loading door(a click should be heard). “Rinse”and “Spin/End” indicator lights flash. Water does not enter the machine or detergent is not wash away. Water tap not turned on. Turn on water tap. Strainer in supply hose clogged. The “ Ready/Wash" and “Spin/ End” indicator lights flash. Washing solution is not completely drained. Loose debris is blocking the pump. Clean the pump. Fluff-producing laundry was washed at a high temperature. The water drainage pipe or drain hose is blocked Clean the water drainage pipe and/or drain hose. Wash Tap not turned on. Turn the tap on. F02 Tap not turned on. Turn the tap on. "Water tap closed?” Water laps not turned on. Turn on water tap. Program continues. "Suds or blocked pump?" Suds or pump is blocked. Use less detergent for future wash loads. Detergents specifically designed tor your High Efficiency washer produce fewer suds and will include the letters "HE" on the packaging. Clean the water drainage pipe and/or drain hose. "Check Door!" Door not closed properly. Check whether laundry is trapped in door. "Tap closed?” even though a lot of water has run in. Safety function has detected an appliance defect. Do not open the appliance door as water may run out! Repeatedly select "Drain" programme until the water level is low enough to remove the laundry. Call Customer Service. “Door open?" Door not closed properly. Check whether an item of laundry is jammed; close the door.